TERRASIL PSORIASIS 44 GRAM JAR SALE!! 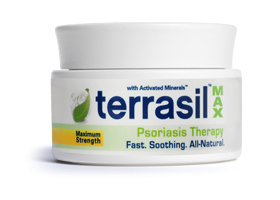 Terrasil Psoriasis Therapy MAX is the only psoriasis treatment available that features patented Activated Minerals™, a proprietary blend including Volcanic Clay (Bentonite) and Zinc Oxide. These nutrient rich minerals support the natural production of new, healthy skin cells, skin repair and reduced scarring. Terrasil’s all-natural moisturizers and essential oils provide additional benefits to dry, damaged skin.